Whether from inside city walls or from above the air framed by clouds, Prosser, Washington is truly a great place to see. The breathtaking landscape of the Yakima Valley that surrounds Prosser Wa makes it an ideal place to visit and experience, whether by land or by hot air balloon. Such beauty is well established; in fact this is the reason why the city has become famous for its annual Great Prosser Balloon Rally. The Prosser Balloon Rally is a fairly new tradition. The first race was formally held in September of 1990, and has been held annually on the same month since then. Before all of this, Prosser was a secret beauty, known only to its residents and residents of the neighboring Tri-cities area of Pasco, Kennewick, and Richland. All of this changed when Ted Wirch, an experienced hot air balloon pilot came to the sleepy town to visit his in-laws and give them a balloon ride as he had promised. It was during this balloon ride that Ted realized the beauty of Prosser town and how the flat, spacious landscape makes an ideal site to launch a balloon rally. Enchanted by the magnificent sights and the wide open spaces, Ted went on a campaign to let his colleagues know of Prosser and what an ideal place it is to hold hot air balloon rides. Hence, the Prosser Great Balloon Rally. Needless to say, Prosser Washington has never been the same since then. What was a well kept secret is now visited by people from all across the country. Hot air balloon pilots who come to Prosser to fly never tire of the scenery. There is always something new to see in this wonderful place, and every flight is a journey of discovery. 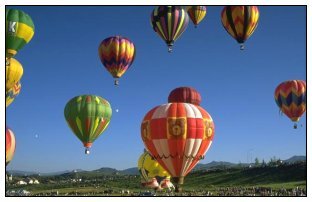 However, you do not have to fly a hot air balloon to enjoy The Great Prosser Balloon Rally. The sight of colorful balloons dotting the clear sky of Prosser is a good enough reason to participate and watch the event. Seeing hot air balloons launch and conquer the sky is an experience in itself. The Prosser Balloon Festival is not just for hot air balloon pilots. Because not everyone can fly a hot air balloon and participate in the actual race, there are other events for the terrestrials on the ground. There will be food festivals, concerts and other shows, bazaars, and exhibits to keep visitors entertained and interested. A highlight of the Prosser Balloon Rally that both pilots and spectators alike look forward to, is the event called the Night Glow. The Night Glow is part of the balloon rally where the colorful hot air balloons are anchored on the ground and then lit to provide illumination against the night sky. During the Night Glow, the balloons look like giant candles aligned against the dark sky, and is a spectacular sight to see. Thousands of spectator line up for the chance to see this event and everyone who has seen the Night Glow say that it is a fitting climax to an all around wonderful event, the Prosser Great Balloon Rally.